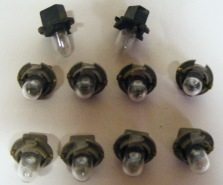 This is a full set of the factory gauge cluster mounted instrument lights and bulb retainers. This is a full set of the factory gauge cluster mounted instrument lights and bulb retainers. 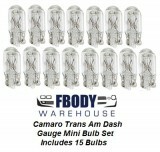 Taken from a 1979 Camaro U-14 full gauges cluster will also include NEW replacement bulbs with this set.